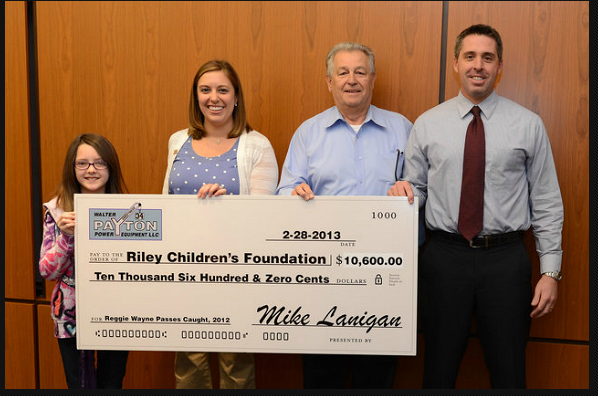 Mike Lanigan and Walter Payton Power Equipment are proud to present a check in the amount of $10,600.00 to Riley Children’s Foundation. Walter Payton Power Equipment, a long-time Colts sponsor, donated $100.00 for every Reggie Wayne catch during the 2012 regular season. Walter Payton Power Equipment carries the name of its founder, Walter Payton, a Pro Football Hall-of-Fame Running Back. Payton played from 1975-87 with Chicago, earning nine Pro Bowl selections and retiring as the NFL’s all-time leading rusher (since eclipsed) with 16,726 yards. Payton loved children and would be very happy to see the legacy of that love lives on with donations made to the children at Riley Hospital. Riley Hospital is known worldwide for all of the excellent care that they provide children of all races, ages and ethnic backgrounds. Photos taken by Matt Bowen. Walter Payton Power Equipment is the leading crane and heavy equipment distributor serving Northern Illinois, Indiana, Michigan and Kentucky. They are proud to offer new and pre-owned equipment from leading manufacturers including Broderson, Mantis, Doosan, and off the Midwest’s largest fleet of Manitowoc and grove cranes. From their new state-of-the-art sales and parts distribution center in Chicago’s Riverdale, Walter Payton Power Equipment offers not only sales but first-class service and parts for products sold. The donation check was accepted by Layla Viles, a one-time patient of Riley Hospital along with Alane Helmer from Riley Children’s Foundation. 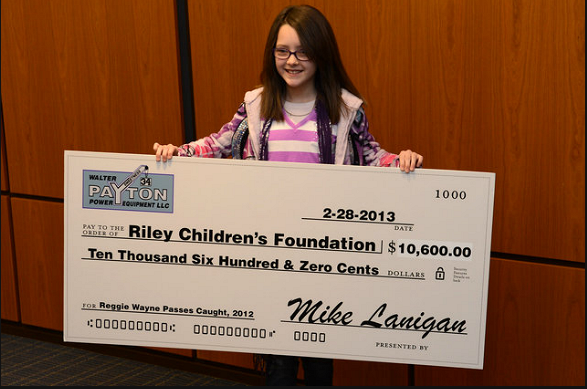 Layla Viles, a one-time patient of Riley Hospital accepts the check being donated to Riley Childern’s Hospital.